The second of a two-part series addresses the nexus between climate change and international security. In early November, Americans honored the service and sacrifices their soldiers have made in foreign wars. Given the discussions at the climate meeting just concluded in Bonn, Americans may wonder whether they will soon find themselves honoring veterans of climate wars. The authors of some of the works highlighted in this month’s bookshelves would argue they already are. Lives and livelihoods have already been sacrificed in conflicts sparked or deepened by climate change. The descriptions of the twelve reports listed below, all released after 2014, have been drawn from copy provided by the organizations that released them. A companion post highlighted nine books published since 2008. The U.S. military’s latest National Security Strategy says that climate change is “an urgent and growing threat to our national security.” What they don’t say is that U.S. security spending should be adjusted to fit that assessment. And we know less about how much we are spending on this urgent threat than we used to, since the federal government hasn’t produced a climate security budget since 2013. In this new report, the Institute for Policy Studies steps in to provide the most accurate climate change security budget currently available. And it looks at how these expenditures stack up within our overall security budget. Then, the report ties the military’s own assessment of its urgent threats to a budget that outlines a “whole of government” reapportionment that will put us on a path to averting climate catastrophe. Over the past ten years, both our understanding and awareness of the links between climate change and security have increased tremendously. However, the links between climate change, conflict and fragility are not simple and linear. The increasing impacts of climate change do not automatically lead to more fragility and conflict. Rather, climate change acts as a threat multiplier. It interacts and converges with other existing risks and pressures in a given context and can increase the likelihood of fragility or violent conflict. Taking the state of play on the links between climate change and fragility as a starting point, Insurgency, Terrorism and Organised Crime in a Warming Climate addresses the question of how the impacts of climate change are a contributing factor in the rise and growth of non-state armed groups. In recent years, a growing number of studies have appeared that analyse the statistical relationship between climate change and violent conflict. This report provides a brief overview of the quantitative literature on climate and conflict, discusses its main findings and draws key lessons for policymakers. Intended as a short guide for non-expert readers, it helps navigate ongoing debates and make sense of seemingly contradictory statements in current research. Moreover, readers are made aware of major methodological issues and provided with approaches to better assess the true scientific contribution of quantitative climate-conflict analyses. The 2015 Paris Agreement represented a huge global effort to safeguard future generations from damaging climate change. But climate change is not the only serious risk to humanity. Our collective commitment to our children and future generations needs to be extended to all existential risks – those with the potential to permanently curtail humanity’s opportunity to flourish. These risks include nuclear war, engineered pandemics, and other catastrophes resulting from emerging technologies. This report makes three concrete recommendations for humanity to reduce these risks: develop governance of geoengineering research, establish scenario plans and exercises for severe engineered pandemics at the international level, and build international attention and support for existential risk reduction. In Epicenters of Climate and Security, security experts identify 12 key climatic risks to international security that may shape the geostrategic landscape of the 21st century. In the wake of extraordinary upheaval in the international effort to address climate change, the report presents a compelling case for why tackling these climate and security “epicenters” – major categories of climate-driven risks to international security – should be a top priority for governments and institutions around the world. The report also outlines the key tools for managing systemic risks that should be included in every climate security practitioner’s and policy-maker’s toolbox. The Center for Climate and Security’s Military Expert Panel Report: Sea Level Rise and the U.S. Military’s Mission concludes that sea level rise risks to coastal military installations will present serious risks to military readiness, operations and strategy. The authors recommend that policy-makers support comprehensive and preventive measures to address increasing risks from sea level rise. Recommendations include (1) building capacity to address infrastructural, operational and strategic risks, (2) gaming out catastrophic climate scenarios in planning, (3) tracking trends in climate impacts, and (4) collaborating with adjacent civilian communities. Policymakers must take action immediately to mitigate the risk of severe disruptions, which could have devastating knock-on effects for global food security. Maritime chokepoints will become increasingly integral to meeting global food supply as population growth, shifting dietary preferences, bioenergy expansion, and slowing improvements in crop yields drive up demand for imported grain. Rising trade volumes, increasing dependence on imports among food-deficit countries, underinvestment, weak governance, and emerging disruptive hazards together make chokepoint disruptions increasingly likely. Climate change will have a compounding effect on chokepoint risk, increasing the probability of both isolated and multiple concurrent weather induced disturbances. Each of the last three decades has been successively warmer than any preceding decade since 1850. These changes will have an escalating, negative impact on our environment, economies, livelihoods and security globally. This report focuses on one particular result from climate change – the negative impact on food security and how this factor contributed to the desperation and anger that manifested itself against the Al-Assad regime in Syria. Environmental Justice Foundation views climate change as a primary threat to world peace and security, development and human rights in the 21st century. With this report for its Climate Campaign, EJF is working to secure international awareness and protection for climate refugees: those who have done the least to contribute to climate change, but who are first and worst affected. This report provides an overview of climate-related security risks and policy responses for addressing those risks. First, it presents findings on six thematic areas in which climate change can pose security risks. Second, it investigates how policy organizations integrate climate-related security risks into their policies and practical work, providing a deeper understanding of the opportunities and challenges presented by different integration strategies. This knowledge is prerequisite to policymakers seeking to accurately assess the value of current strategies and identify how policies, strategic guidance, internal organization and procedures could be improved in order to respond better to climate-related security risks. Climate change is one of the most important challenges that humanity collectively faces in the 21st century. The repercussions for foreign policy agendas are substantial: increasing water scarcity, more flooding, and extreme weather events threaten millions of livelihoods across the world, sometimes forcing people to migrate. Many developing countries and fragile states that lack stable institutions are likely to be hit hardest. A new profile of climate diplomacy is evolving to make use of a full range of policies, including development cooperation, conflict prevention efforts, and humanitarian assistance, in addition to more traditional measures of climate change adaptation and mitigation. These new approaches for foreign policy go beyond the traditional realms of climate policy. Climate change is expected to contribute to the movement of people through a variety of means. 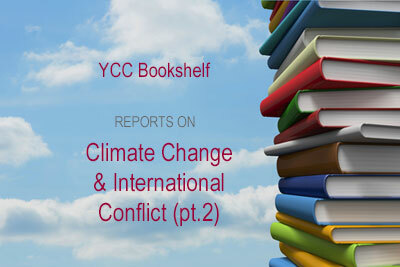 There is also significant concern climate change may influence violent conflict. But our understanding of these dynamics is evolving quickly and sometimes producing surprising results. There are considerable misconceptions about why people move, how many move, and what effects they have. In this report, USAID’s Office of Conflict Management and Mitigation and Wilson Center’s Environmental Change and Security Program present a guide to this controversial and consequential nexus of global trends. Building off a workshop held at the Wilson Center in 2016, it provides a background scan of relevant literature and an in-depth analysis of the high-profile cases of Darfur and Syria to discern policy-relevant lessons. The Working Group on Climate, Nuclear, and Security Affairs (CNSA) was launched in 2016 by the Center for Climate and Security. This groundbreaking effort stems from the mounting evidence that various security challenges, climatic trends, and nuclear issues are combining in new and potentially high-risk ways. In the first report in a planned series, the CNSA recommends beginning with a few broad but clear steps to begin advancing U.S. interests regarding intertwining climate, nuclear, and security affairs. These include developing realistic planning scenarios, improving communication regarding existential nuclear and climate risks, and educating policy makers about the practical ways they can protect America’s capacities for navigating these challenges.